88 colors of beautiful eyeshadow makeup. Pallet design for convenient use. 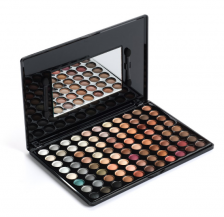 Palettes include matte and shimmer lip gloss, allows you to create many different looks. High quality ingredients that provide a silky shine that lasts all day. Does not contain dye and will not leave marks. Provide a glossy look while also nourishing skin. Excellent for parties, casual wear, fashion shows, make up courses and more.